(“I don’t speak French”) I say this more than anything else I say in French, except maybe Je suis desolee, je ne comprend pa (I’m sorry, I don’t understand). Madame Koepplinger, my AP French teacher and leader of the French club at my high school, would be disappointed indeed. I began studying French in 10th grade. My first nine weeks I earned a D, the only only one of my life. I hated conjugating, I couldn’t remember the vocabulary, and I disliked doing poorly at something. But I got over it and grew to love it, especially with a new teacher in 11th grade. By my senior year I was in AP and the club, and placed out of the mandadory foreign language requirement at Queen’s College Charlotte my freshman year. I took what I guess was intermediate French anyway, and skidded through on what I remembered from high school. Nearly ten years later I went to France. Finally. Brian and I landed in Paris at dark-thirty in Beauvais airport, way outside the city. I couldn’t muster up the nerve to ask the bus driver what time we left the airport even though I could form the words in my head. We got to the city and needed an ATM for francs for a taxi. I repeated to myself, over and over, clutching my little phrase book: Ou est un distribetuer de billets? 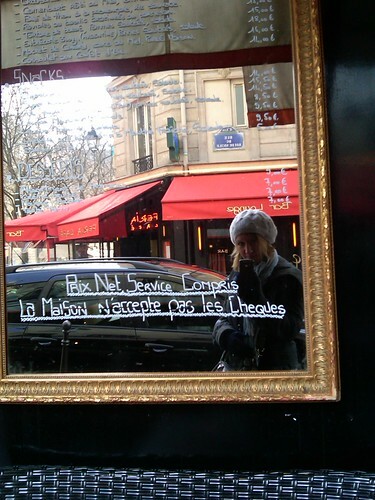 I walked, fearful and awed, into my first Paris bar (the only thing open). I spotted what looked like a friendly woman. I opened my mouth. I froze. And, it pains me to admit this, but I opened my little book and bless my young, inexperienced self, I pointed at the phrase in French and smiled hopefully (or pathetically perhaps). She very kindly pointed me down the street (in English) to an ATM. I worked up the nerve to tell the taxi driver to gardez la monnaie (keep the change). He understood me and I had my first taste of the particular glee that comes from opening my mouth, uttering foreign words, and being understood. In the years since, I’ve returned to France a number of times, and each time before the trip I make an attempt at “brushing up” on my French with varying degrees of dedication and success. Some of my methods have included reading le Monde and looking for a similar article in an English paper to see how much I garnered, instructional CDs and podcasts (my grown-up version of listening to cassette tapes as I slept like when I was a teenager), French radio stations, French films with subtitles, and a picture book that I should really return to the Somerset library at some point. Each time I arrive in Paris I am slightly more confident than the time before, but still stumble and bumble my way with the vocabulary of a slow four-year-old. To the taxi driver I say: “I stop here. Get out. I walk now.” And that’s if I’m even half as good as I think I am. I have pretty good restaurant French. I can make a reservation, order and generally handle all business related to food. A particular triumph on my last trip was when they charged me more for wine than they should have. I managed without even a book to say what I think was, “The wine is 30 euros? I think it is 20 euros.” Sure enough, they took my bill and refigured it and explained the confusion. But I’d like to actually carry on a conversation. I have missed so many conversations because I can’t do much after I’ve introduced myself and say “I have a small dog. His name is Truffle.” I talked to as many people as I could last time — being alone on a trip propels me to try to talk to more people, but after initial pleasantries I’m stuck. And if Brian and I are ever seriously moving to France — and do we ever hope to — we seriously need to do more than make restaurant reservations. And if I’m limited, Brian is a complete beginner. Bonjour and merci make up his vocabulary. I hope from her I can learn — besides more vocabulary — an ease, and and a comfort in speaking French. I am almost unbearably self-conscious about it, and will sit and laboriously try to work out a full, correct sentence before I speak. Often the opportunity is passed before I say it, or I chicken out and do it in English. I’m really excited about this and can’t wait to get started. If I can’t be in France, at least I can bring a little of it into my life. Good luck, Dana! I’m very much in the same boat with French. I’ve tried so hard, and I can read fairly well, but when it comes to speaking or understanding someone speaking at a normal speed, I’m hopeless. Gaining the confidence to speak (and understand) is hard. I was a French major and I had a hard time at first when I moved to France. They don’t teach you the little everyday phrases and things you need to know. You learn the basics and can carry on a simple conversation, but anything beyond that, yikes! I felt so out of sorts at first- and I was supposed to know this stuff! I mean I had written a 20 page paper in French and all. But speaking is so different. Getting my first haircut in France was a disaster. I tried to study magazines and things for the right words but I still didn’t know what I needed to say. But by the end of my stay, I was babbling with confidence, and my students commented on the improvement. It does get easier with lots and lots of practice. Plus speaking with a native is the best way to go. Having a base to start with is great, but in order to truly get into the conversational stuff, you need a person. Oh, if you can get your hand on some translated romance novels- they’re in conversational French. I used to buy translated Harlequins when I was in Valenciennes to boost my vocab. It helped immensely. My eternal struggle – to speak a meaningful conversation! It is very difficult for me to put everything together and then get it out of my mouth correctly – in French! One tip which has served me well over the years as you speak in a foreign language – don’t get all fussed when they ask you “Quoi? ?” – or ask you to repeat something. It probably isn’t because you said something wrong – it is probably because they just want to reconfirm what you said or they didn’t hear you. Think about how many time you repeat what you said when you are speaking in English, here in America – you do it all the time and never once do you think you said something wrong. But when it happens in French it is an automatic assumption that you said something wrong – when really the person just wants you to repeat what you said. Bonne Chance with the French lessons! How wonderful you’ve found someone to help with your language skills!